NEW SERIES: What’s the Story With That Place? We all do this, right? We pass by certain properties and think, “What is the story with that place?” Granted, these questions rarely escape the confines of our cars/brains, so our curiosity often fades into the upholstery with the coffee stains and Cheetos powder. But we at the Outpost want to actually find out — what is the story with these places? So we’re launching a new series devoted to peering behind the cracked façades of Humboldt’s unusual, eroding or otherwise curious properties. If you have a spot in mind — some abandoned warehouse, architectural treasure or bizarre commercial monstrosity that’s always piqued your interest — then send a nomination for this series to news@lostcoastoutpost.com. The original building was completed in 1953, with labor donated by members of the Eureka Assembly of God Church, a Pentecostal congregation that subsequently made the church its home, according to a 1958 photo caption in the Humboldt Times. Image from March 16, 1958 issue of the Humboldt Standard. Thanks to the Humboldt County Historical Society for research assistance. The original chapel, with its peaked roofline and towering cross, has been supplemented with boxy, industrial additions on each corner. That orange fence netting and the pile of rubble on the lawn are evidence of the clean-up and renovation work that has been creeping along under the current owners, a nondenominational Christian church called North Coast Ministries. 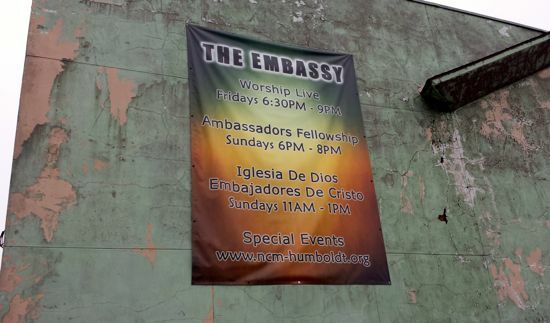 Most of the building is in accessible to the public, though portions have been cleared for use by the City of Eureka and the fire marshal, according to Trent Zelanick, a minister at the church. Neighbors and city officials have been keeping tabs on the building for years now. The church was already being described as dilapidated in 2007 when a group of West Side residents raised a ruckus at a series of city council meetings, angry over the prospect of a pending sale and plans to turn the place into Redwood Teen Challenge, a 50-bed residential drug treatment facility. The public outcry succeeded in scaring off the buyers, and so the church went back to being a target for theft, vandalism and trespassing. In November 2007 the City determined that the building was in violation of Eureka’s vacant and/or boarded building ordinance, and it issued a notice of substandard conditions with an order to clean it up. The owner at the time was the Pentecostal Church of God, which had purchased the property from the original owners in 2003. Representatives of the Pentecostal church fought with the city over the next several years while trying to offload the property. In 2009, while a sale to North Coast Ministries was being negotiated, Pentecostal Bishop Lonnie J. Cox authorized Zelanick to obtain building permits. Garbage and building materials piled up along the church’s southern wall. The sale to North Coast Ministries finally went through in March 2011, but conditions haven’t improved much — at least on the outside. In addition to the battered and crumbling siding, the alley along the church’s southern side is piled with trash, including lumber, plastic hosing, faux-rock walls, a couple of outdoor barbecues and several vehicles, including a pickup truck whose bed is filled with old tires. But work is being done, Zelanick said. The stucco was stripped, revealing the tarnished cement under-layer, in preparation for resurfacing. “There’s a way to embed fiberglass mesh to clean up the imperfections and cracks and seal it from weather damage,” Zelanick said. After that he plans to have the walls insulated and covered with an acrylic-based stucco-like finish. It’s just a matter of financing. In May the City’s engineering department issued another notice of required improvements, including new drop curbs in the sidewalk and asphalt paving for the alley on the south side. Zelanick said he now plans to do the resurfacing himself, and he hopes to have the majority of it done before the end of the summer. A cinderblock ramp has been added to the building’s north side, facing Wabash, and scaffolding has been erected for the purpose of pressure-washing the walls. In the meantime, North Coast Ministries continues to hold services several times a week, including Spanish-language services on Wednesday and Sunday mornings, English-language services on Friday nights and Sunday evenings as well as a burgeoning after-school program, according to Zelanick. Again, if you have a nominee for “What’s the Story With That Place?” send it to news@lostcoastoutpost.com.